Bioinformatics is an interdisciplinary field which has played central role in the integration of computational techniques to solve biological problems. Computational methods have long been practiced in biology and perhaps, Fibonacci series was the most remarkable historical breakthrough in which Fibonacci used mathematical model for biological systems. Another exemplary work was performed by Gregor Mendel, who identified biological pattern of inheritance by devising Punnett square model for alleles of genes. Mathematical model integration was then continued by Thomas Hunt Morgan and later by his student who managed to group genes locus wise on chromosomes of Drosophila Melanogaster. Population geneticists used allelic frequency model to calculate frequency of most prevalent alleles in a population. With the sequencing of protein amino acids and DNA nucleotides, a new era of mathematical expansion in biology started. Margaret Dayhoff in 1978 designed Point Accepted Mutation (PAM) matrices to find out replacements of amino acids in primary structure of protein through the process of Natural Selection. Smith-Waterman and Needleman-Wunsch algorithms are key algorithms in alignment of gene sequences. In 1992, Henikoff and Henikoff presented Blossum matrix scoring function for protein alignment. Together, these alignment algorithms have currently become basics or starting point of most of the biological experiments. The alignment algorithms have helped us to discover not only mutational differences between sequences of genes but also these algorithms have been implemented to draw evolutionary relationships between living organisms. Martin Karplus, Michael Lavitt, and Arieh Warshel jointly shared 2013 Noble Prize for successful implementation of Mathematical simulation models to biological systems. They started a new era of Structural Biology that tends to find out 3-D structures of Biomolecules and their interactions with each other computationally. The accuracy of simulations is more than 90% that makes it a favorable choice of experiment when X-ray crystallography or NMR data is not available. Molecular docking is another technique that is employed to find out interactions between two biomolecules (preferably Protein-Protein Interactions or Protein-small molecule interactions) with minimum free energy state. Molecular docking has started new era of Computational Biology called Computer Aided Drug Design to design drugs against fatal diseases in exponentially less time. “Far too many diseases do not have proven preventions or treatments. To make a difference for the millions of Americans who suffer from these diseases, we must gain better insights into the biological, environmental and behavioral factors that drive these diseases. Precision medicine is an emerging approach for disease treatment and prevention that takes into account individual variability in environment, lifestyle and genes for each person.” (On January 20, 2015, President Obama announced the Precision Medicine Initiative® – PMI). This era belongs to Personalized Medicine or Precision Medicine which collectively integrates all the Bioinformatics methods and analyses techniques including DNA sequences, family history, medical history, and environment to design individual specific medicines that will surely revolutionize lifestyles, lifespan, and thus Medical Science to its new heights. As Bioinformatics methods and techniques are now considered as basic requirements for most of biological experiments, this book will help researchers to have an idea of how to initialize, design and add new layers of knowledge. This book does not cover all, but most of the major domains and utilizes most cited and most used tools and techniques. The material of book has been designed for novices to take them up to pro level in Bioinformatics. Many small tricks have also been discussed that would help researchers to easily understand theory, perform experiment, and analyze results. As a matter of fact, it is believed that this book must be part of every laboratory that needs Bioinformatics analyses for their experiments. The discussion of the bulk amount of informational data in biological sciences is still an understatement. The bioinformatics studies are being practiced in all over the world by universities, scientific groups, international and national companies and consortia, and it would not be underestimating if bioinformatics will be thought of as bedrock of future biological sciences. Bioinformatics evolved into complete interdisciplinary science to solve the biological problems by utilizing statistical, mathematical and computational approaches. Furthermore, the recording, annotation, storage, analyses, and searching/retrieval of biological information and representing this concluded information in order to understand various pathways, to educate ourselves, to understand biological processes in disease and healthy states, and also find potential drugs are only some aspects of bioinformatics. The conjuring of new ‘Big-Data’ associated typically with enormous databases of protein/gene sequences, and functional/structural information into which novel proteins and genes sequences are constantly deposited, can easily be searched by remote computer access with already known sequences. Numerous bioinformatics tools are freely available on the Internet to whoever wants to utilize them and it is impossible to list them all. The ability to collect, save, annotate, analyze, and distributes the biological information retrieved from sequencing and functional analyses is significant for modern biology. This is the reason behind the wide spread belief that the long run significance of bioinformatics approaches lies not much in the available tools, but in the annotation of data and concluding logical information that bioinformatics delivers for the improvement of life sciences. Bioinformatics is to solve the biological problems with advanced computational manners by applying statistical and mathematical approaches. Structural bioinformatics is to predict and analyze 3D structures of macromolecules while Computer aided drug designing (CADD) helps scientists to design effective active molecules against diseases. However, the concept of structural bioinformatics including CADD is still hard to grasp for students and even more for educated laymen. As a beginner, I fall into the first category with regards to this subject. Indeed, I first learn all these guidelines and tools for myself; in order to learn new emerging trends and approach my work with greater awareness about computational skills in biological problems. I felt that I need better insight into the CADD to achieve and improve the drug designing to reduce the time phase and resources. When I consulted the literature on this topic, I found that although there are many papers and books on the subject, the exact step by step working of basic tools and thorough analyses of generated results that I was looking for were scattered throughout them. I then began taking notes, and when I was finally satisfied, I discussed this with my colleague and a good friend (Rana Adnan Tahir). We realized after organizing the data in a suitable presentation, that it was potentially interesting for students and new learners to have visually detailed step by step working of tools and identify a lead compound. We believe that a better understanding of these concepts requires a more satisfactory verbal explanation than is visually provided, since, in our opinion, a visual step by step approach is the one closer to the understanding capability of non-experts and even for our own students. This is why this book is focused on providing a visual account and step by step guideline to identify a lead compound by computational means. In this sense, we deem that, besides the verbal working of tools, a visual step by step explanation can be very useful regarding designing of the compounds for the people who do not have a full understanding of it yet. Thus, we eventually came up with the present work, targeted to students and non-experts who are specifically interested in this domain and have a basic knowledge of structural bioinformatics. With this book, we attempt to show the step by step working of basic tools for drug designing wherein analyses of generated results is always a priority. The protein sequence of RASSF2 was retrieved from UniProt and primary sequence analyses, secondary structure prediction and 3D structure prediction was performed followed by molecular docking studies. The basic information about bioinformatics and utilized tools is summarized in the first chapter. The book is summarized just as we wish we had been taught the core concepts and the working when we were first introduced to it. Therefore, we hope that it can be helpful as a guideline for drug designing by in silico approaches. The main text of the present work aims to demonstrate the step by step visual demonstration of the basic tools of structural bioinformatics and also is focused on the scientific point of views. 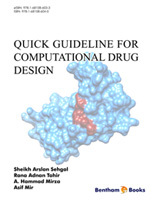 If a beginner retrieves a protein sequence and performed all the steps described visually in this book will not only learn the computational drug designing but also can generate a publishable data. We would like to acknowledge our students Zunaira Khalid, Sonia Kanwal, Naima Javed, Tassaduq Hussain Jaffar, Bilal Chaudhry, Nadeem Amin, Sumaiya Fatima and Azka Ahmed for their help in completing this project. The authors are also grateful to the Department of Biosciences, COMSATS Institute of Information Technology, Sahiwal, Pakistan for encouraging and providing the platform. Sheikh Arslan Sehgal and Rana Adnan Tahir acknowledge their good friends Sajjad Ahmed Larra and Muhammad Sohail Raza for their kind support in preparing this book. Sheikh Arslan Sehgal acknowledges Dr. Ashir Masroor who becomes the ignition in this project. for the gift of writing he gave me". I know, you read many books in your life and you flip to the dedication page and find that the author has dedicated the book to someone else, not to you because the authors of those books were not your sons. But, in this book your son is the author and dedicating this book to you. I dedicate this book to my Father, Muhammad Ashraf Sheikh, who took me to the school for education, who always encouraged me to read books, and helped me transform into the person that I am. To my Mother, Naeema Ashraf Sheikh, who always made delicious food for me. To my Wife, Nisha Arslan Sehgal, whom I got married at the time of finalizing this book and spend more time on the laptop and she showed patience when her husband was working on weekends while on vacations too. To my Brother, Babar Ashraf Sheikh, who made me an author, and always listened to my all stories from childhood uptil now. To my Father-in-law, Chaudhary Muhammad Akram, who loves me a lot.